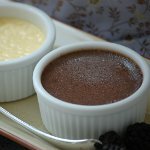 Adults and children love creamy chocolate pudding, that is a delight on its own and an addition to some sweet treats. Celebrate National Chocolate Pudding Day on June 26. Chocolate pudding is a variation of chocolate custard, but it is made without eggs and cornstarch or flower is added as thickener. Sometimes eggs are also used, but you can omit them if you want to make your treat lighter. Homemade chocolate pudding would be a perfect treat to celebrate the holiday. Melt 4 ounces of bittersweet chocolate, whisk together 1/2 cup of milk and 3 tablespoons of cornstarch. Pour 1 1/2 cup of milk into a saucepan, add 1/2 cup of sugar, pinch of salt and 2 tablespoons of unsweetened cocoa powder. Simmer mixture over medium heat, stir in milk with cornstarch and, whisking constantly, bring it to boil. Cook for 1 minute. Remove pudding from heat and stir in melted chocolate and 2 teaspoons of vanilla extract. Spoon into serving glasses. Cover surface of pudding with plastic wrap (it will prevent forming of skin) and chill. Serve homemade chocolate pudding with fresh fruit to your liking.